Looking to buy the best iRobot Roomba for you but confused by all the features? This page has an explanation of all of the current ones. Almost all of the iRobot Roomba vacuum cleaners have the following features: Vacuums dirt and dust (OK that’s pretty obvious) with the push of a button. The Roombas do not have a dust bag, so you don’t have to keep buying bags for it. It also has a fine filtration system designed to trap allergens. They also have built-in sensors that keep the robot from going over cliffs. You don’t want your expensive robot vacuum cleaner falling down the stairs! Here are some of the features that don’t really come with all the Roomba vacuum cleaners. Just between you and me, almost all the really cool features are on the 500 series vacuums and not on the 400s. Check them out. Fast Charging: Some of the Roombas feature a fast charger. So they charge in three hours instead of the normal 7 hours. 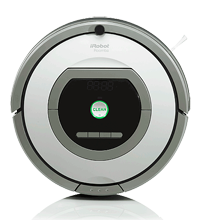 Detects Dirt: Almost all of the Roombas can detect areas that are especially dirty and then spend more time cleaning that area. Some of the robot vacuums will beep to tell you that they just found an especially dirty spot, which is amusing. Spot Mode: You can put the Roomba on a spot that you want it to concentrate on or clean up fast. To do this, you place the robot vacuum cleaners where you want them to clean up and press the Spot Mode button. Max Mode: Very few of the Roomba robot vacuums have this. It makes the Roomba spend even more time cleaning up a spot. So it would be for really messy areas. Self-Charging Home Base Compatible: Almost all of the Roomba vacuum cleaners are able to do this. When the robot is done cleaning a room, or if it needs to charge its battery, the vacuum cleaner will find its base and dock with it. On-Board Scheduling: Many of the robot vacuum cleaner are able to keep schedules. So if you want the vacuum cleaner to clean every day while you’re at work, you can program it to do that. They can be programmed to activate up to seven times in one week. Voice Demonstration: The robot has a voice that can demonstrate how to best use the Roomba, and also tells you if the robot vacuum cleaner is in need of maintenance or assistance. Light Touch Bumpers: These are basically self-descriptive. Although the Roombas are vbery gentle when they bump into things, the Roombas with Light Touch Bumpers are even more gentle. Advanced Anti-Tangle Technology: Many of the new robot vacuum cleaners are built so they don’t get stuck by cords, fringes, and tassels while they are vacuuming a room. This is especially good news for people with oriental rugs! Improved Edge and Corner Cleaning: Sometimes robot vacuum cleaners have problems getting dust and dirt from under cabinet edges and corners. These Roombas are equipped with side brushes which reach out to help clean corners and baseboards. Improved Navigation and Floor Coverage: Another self-descriptive item. Roombas with this feature use the newest software designed to help them vacuum floors more effectively and get the entire floor clean every time. High Capacity Sweeper Bin: A few of the Roombas have a larger dust bin, so you don’t have to empty the robot out as often. If you have pets, this is a great feature, because Roombas vacuum up a lot of hair very quickly. Easier Maintenance: Some robot vacuums are designed in such a way that the filters and brushes are much easier to clean. Thus maintaining your robot is much easier. These vacuum cleaners also have a voice which will walk you through how to set it up and will also beep at you when the Roomba needs help or maintenance. Wireless Control: A remote control so that you can steer your Roomba from across the room, maybe to guide it to particularly messy areas. Or maybe just for fun. Lighthouse Technology: The lighthouse is a way to make it so that a Roomba will clean one room completely and then move on the the next room. While the robot vacuum cleaner is vacuuming the first room, the Lighthouse will block the door out of the room. Then once the first room is clean, the Lighthouse will allow the robot to leave the first room, and go into the second room. Once the Roomba is in the second room, the lighthouse will block the vacuum cleaner from going back into the first room. Virtual Wall: You can use these markers to keep a robot vacuum cleaner from going into places in your house that you don’t want it to visit. They are also handy for blocking open doorways. Extras! These are just extras that come with some Roombas and not with others: Extra Brushes, Carrying Case, and Extra Filters.